Tired of stepping on LEGO everywhere? I am. 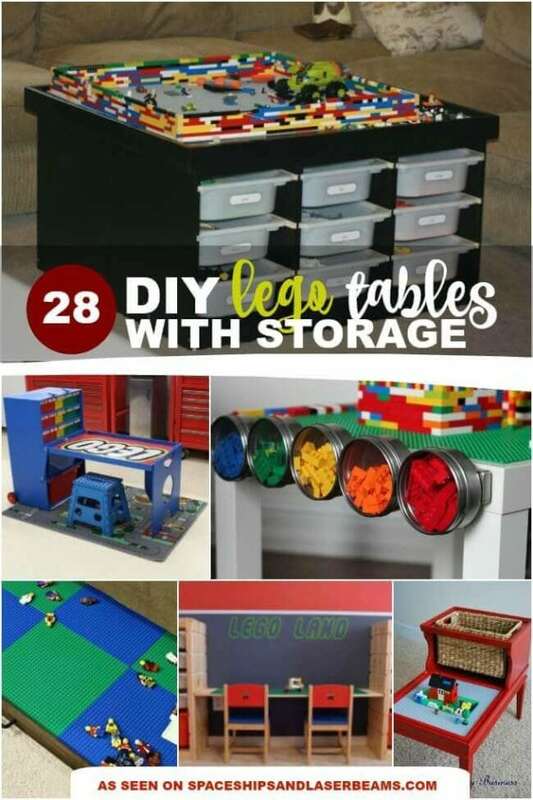 It’s inspired me to collect the best DIY LEGO table ideas with storage that I could find! There are ideas for easily constructed LEGO tables that offer up plenty of drawer space to store and organize LEGO pieces by size or color. Great IKEA LEGO table hacks – including how to easily turn the IKEA LACK side table and the IKEA TROFAST into LEGO playing tables with storage. Tray solutions so kids can play with their LEGO on the floor but then easily put them out of sight when it’s time to clean up. Suggestions for repurposing older pieces of furniture you already have – check out the example on how to turn your existing train table into a LEGO table, as well as how to reuse a coffee table as a rockin’ LEGO table. If you’re feeling ambitious, there are directions and plans for How to Make a LEGO Table out of Wood, as well as for a portable LEGO creation station. For a quick fix, see the examples for using plastic bins. Clever ideas that double as home decor, at least for a boy’s bedroom. Check them out and get ready to see your floor again! Learn How to Make LEGO Soap Party Favors your guests will love! Do not miss these 6 LEGO Party Games and Activities for lots of fun at your next party. 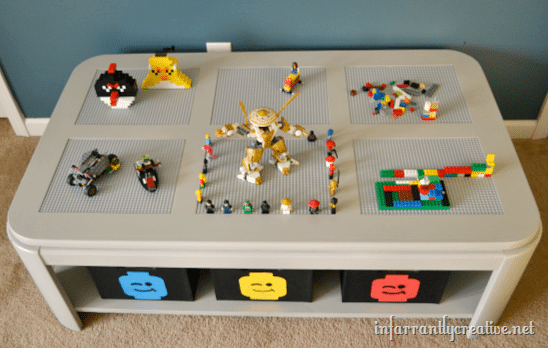 Check out these amazing LEGO storage ideas. Would you believe you can put together your own DIY LEGO play table in a matter of minutes for only about $30? Believe it! This tutorial may be the easiest ever for putting together a LEGO table. Your kids will love having a place to build with their favorite LEGO building blocks, and you’ll love having LEGOs off of the floor. Win-win. Transform some IKEA shelving into an awesome LEGO playhouse! This LEGO hack is simple and quick. All you’ll need is a 2×2 Expedit, 4- 32 x 32” LEGO base plates for each of the shelves and 2- 48 x 48 base plates to form a soccer field. Strong double-sided adhesive keeps the base plates in place for endless LEGO play. 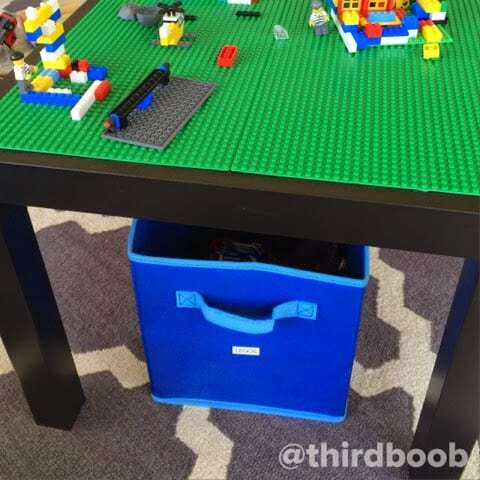 Follow this tutorial to add under table LEGO storage to an IKEA LACK model kids’ table. On top, LEGO base plates provide a great place for building, while the under-the-table mounted storage gives you a great place for containing all of the LEGO pieces. If your kids love building with LEGOs and you love being able to hide the mess, this DIY LEGO tray made from wood is a great solution. Your kids can use it to build on, and when finished, it easily slides under a sofa until the next round of building. Plus, the flat surface makes a great place for playing board games or housing snacks for movie night. Bonus! This adjustable LEGO table with storage is pure genius! The DIY plans utilize the IKEA Trofast storage system and combines popular LEGO storage ideas with an adjustable table/shelf that can be used as a building surface. One side is covered with green LEGO base plates (glued on with E6000 glue), while the other side is left smooth for a more flexible building option (or other use). You’ll love how much storage you’ll have for not only LEGO pieces, but instruction manuals too! Bonus: the shelf/table surface is adjustable, so you can raise the height as your child grows. This lady must be the Old Dresser Fairy Godmother. She found a no-longer-useful dresser at a thrift store and transformed it into an awesome LEGO play and storage table. It took a few jigsaw cuts, wood scraps, glue, paint, and imagination. 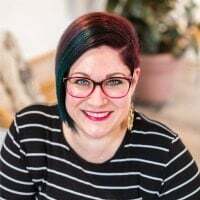 She shares details and makes it look easy. My favorite detail is the drawer pulls that make them look like LEGO bricks. If you’re handy with tools and you really like the process of building, this detailed tutorial will walk you through the process of making your own LEGO table out of wood from start to finish. While definitely more time consuming, the satisfaction of knowing you handcrafted something that will be enjoyed for years to come, may be worth it. This design allows for the addition of plastic storage bins, which means LEGOs can be stored as part of the table. If you’re tired of stepping on LEGOs and want a place for your children to build and store their Legos, this IKEA hack- DIY Lego table may be the perfect choice. Besides the IKEA Lack table and some various organizational drawers, trays and inserts, the only tools you need are a glue gun and mounting tape. No power tools required. And, this DIY LEGO table can be built in less than an hour. Your kids can kneel right up to this table or sit on small chairs or ottomans for hours of LEGO building fun. This awesome LEGO table for the floor is mounted to rolling casters and is sized to fit under a bunk bed. How genius is that? The detailed instructions will walk anyone comfortable with power tools and building through the building process. The most expensive part of the project are the 10 x 10 LEGO building plates (12 of them), which can be used for many years to come. If space is a concern, this single IKEA Trofast storage unit LEGO table design is a great solution. Assembly is relatively quick and easy. It boasts 2 of the 15 x 15 gray LEGO baseplates on the top for plenty of building space. Double sided tape was used to attach them to the table. Six storage tubs fit underneath for organizing all kinds of LEGOs. This IKEA side table turned LEGO table hack is inexpensive and simple! It’s the perfect solution for a small space as the tabletop is only slightly bigger than 4 building baseplates. Plus, you only need strong double sided tape and base plates to complete the transformation from constructed side table to LEGO table. I love that this LEGO table incorporated both blue and green LEGO baseplates to represent both land and sea. This LEGO building table transforms an old drab piece of furniture into a child’s dream building table. Get inspiration for updating an old piece of furniture into a LEGO table using a quarter round to trim out part of the table, some liquid nails to attach the base plate, and a basket for LEGO storage. 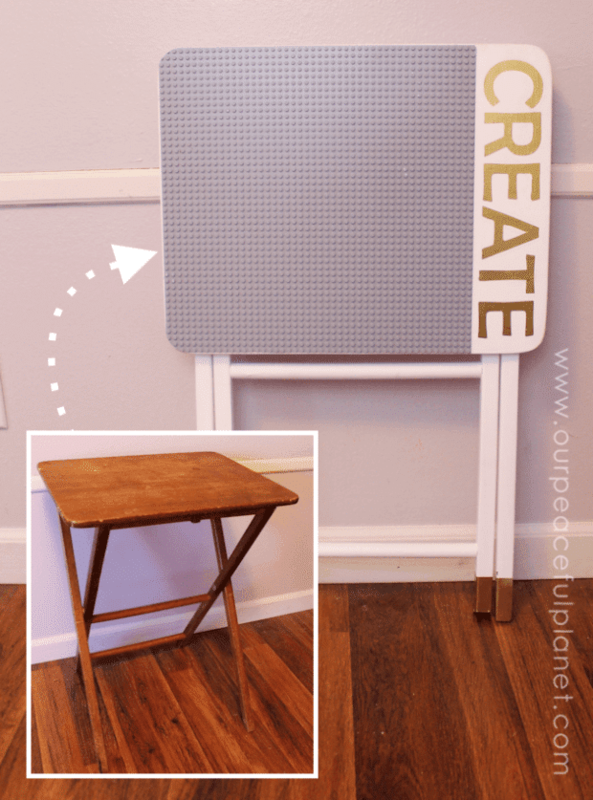 Using a folding TV tray is a simple way to add (and subtract!) LEGO play space. Current projects are off the floor and the table takes up very little storage space. Make your LEGO table chic by painting the TV tray to match your décor and adding hints of gold on the legs. If you give a kid some LEGOs, he is going to need a LEGO building table to go with it. For those who don’t have room for a permanent Lego table, this easy-to-make table is constructed using a 34” Lifetime fold-in-half table, making it storable and very portable. The size of this table makes it possible for a good-sized group to play with LEGO pieces together. Gluing the LEGO building plates to the table was easy with Liquid Nails. This is a great LEGO table and storage solution using the popular IKEA Trofast storage units. While many similar designs feature LEGO baseplates that are permanently affixed to the wood table top, this design left the permanent adhesive out of the plans so that the table could be used for other purposes, like playing games, too. A few printable labels taped on to storage bins help to keep the LEGOs organized and off the floor. Just when you think you’ve seen all of the DIY LEGO table ideas, this simple idea surfaces! Would you believe it is made from a wooden breakfast serving tray? This makes it easy to store and transport. You’ll only need a few supplies to create this DIY LEGO tray—a wooden breakfast serving tray, 3 LEGO green building plates, Elmer’s Pro-bond glue, vinyl letters and LEGOs. This portable Lego creation station is completely handmade and includes a lot of thought. The creator wanted it to be portable, have adequate and organized parts storage for current in-process builds, as well as fast put away storage plus neatly fold up for a more compact, neat look. This LEGO table and storage project is definitely more involved, with multiple steps and a long supply list, but you’ll be amazed to see the end design which will last for many years as a child grows. Using 2 IKEA Trofast storage units and lidded boxes, this DIY LEGO table is great for those seeking a more permanent LEGO building and storage solution. With two storage sides, you have a total of 12 bins to store all of the LEGO blocks, which gives room for adding more LEGO pieces to your child’s collection. Kids will enjoy hours of Lego building fun on this Lego table created from an IKEA Lack table, building baseplates and under-table storage bins. Can you believe that this can be created for less than $50? Simple table assembly and a little gluing later, and you’ve got a great table for your LEGO lovers and their friends to enjoy hours of LEGO building. When you are on-the-go or traveling and need a portable LEGO kit for your LEGO -lover this lunchbox LEGO kit is a great solution. To create the traveling LEGO kit, you will need to trim down a building plate to fit the inside of the lunchbox lid. Round out the corners with a little sandpaper and adhere with double-sided foam mounting squares. Line the bottom with felt, and add your LEGO pieces. Now your kids can enjoy their favorite building blocks on the road. This LEGO meets IKEA Lack table transformation incorporates LEGO road baseplates on top and clear plastic storage bin LEGO organization underneath. The end result is awesome and doable by just about anyone. Your child will get a great building surface, and you will get some affordable organization for those LEGOs, all contained within 30 square inches. If you want a LEGO table that has both room for building and built in storage, this DIY design is for you. The plans center on an IKEA Ingo table and involve using a drill with a spade bit and a jigsaw to cut out rectangles from the wood table top for inserting IKEA Trofast storage buckets. Gray 15 x 15 base plates are adhered to the tabletop with super glue for building. 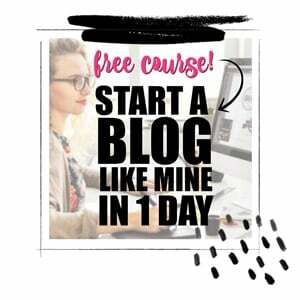 Love using power tools and have the necessary skills to build? This LEGO table made from modifying an IKEA Vika Imon tabletop and Moliden Underframe is a great project. This table is geared for older, bigger children who still like to build. The LEGO table and chairs are regular height. While this LEGO table is a little pricier ($200), it is built to last. The best design feature of this plastic bin LEGO table is that it is not permanently fixed together, allowing flexibility in taking it apart or moving it when needed. It is created from three plastic drawer units with wheels, a 4 foot board that lays on top and LEGO bases adhered to one side of the board for a building center. When not in use, the 3rd drawer unit can be stored underneath or quickly pulled out to allow for more seating at the LEGO build area. And, the top can be completely removed and laid on the floor for playing. It can also be flipped over to the smooth surface side and used as a writing desk. Do you have a train table that your children don’t play with very much? Don’t throw it out just yet. You can convert it into a LEGO table that can still function as a train table. Adhering LEGO base plates to a piece of MDF cut to fit the inside of your table gives you a removable LEGO building surface. This means that kids can play with LEGOs, and when they are ready to play with trains, they can simply remove the LEGO insert. How easy is that? You’ll love that this project is a simple DIY costing less than $70! Instead of buying a LEGO table, build your own for a fraction of the cost. This ultimate LEGO table was made by purchasing a basic $8 table from IKEA and gluing LEGO base plates to the top surface. But, the fun doesn’t stop there! On one side, hanging buckets were added and a magnetic strip with metal tins was added to the other side for more LEGO storage. Would you believe this whole LEGO table build project cost less than $50, compared to similar premade LEGO tables selling for 3 x as much? If space and LEGO organization are challenges you face, then this DIY LEGO wall storage idea is for you. A simple curtain rod, S hooks and handled pails from the dollar store helped this mom with a great place for her children to store LEGOs. A quick installation of the curtain rods onto walls provides for easy pail storage using the S hooks. Kids can easily remove a pail for easier access and play and hang it back up when finished. Don’t discount the usefulness of those 1980s Parquet tables just yet. 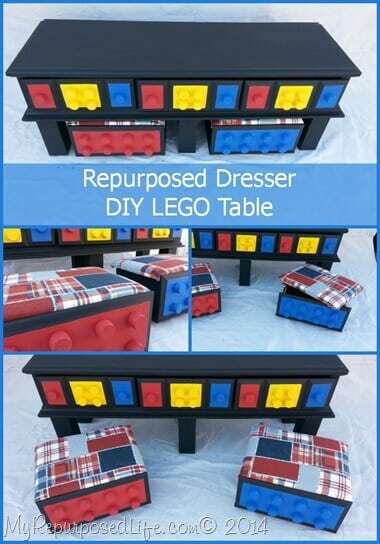 This transformation of a used coffee table into a rockin’ LEGO table may just amaze you. A little MDF, some liquid nails and a coat of paint later, and you have one awesome place to build with LEGOs. Your Lego-loving child will enjoy having 6 unique areas at which to build with removable inserts so that base plates can be switched around or taken for on-the-go building. You’ll also love that the table has an under area storage for canvas storage bins. Get inspired with these toy storage ideas. These awesome pallet projects are a great DIY to improve your space. Take a peek at these LEGO Building Books that every kid will love!